The cloud-based applications software provider, Workday (WDAY) will report fiscal Q1 results tonight after the close. The options market is implying about a 6.5% one-day post-earnings move which is rich to its 4 qtr average one-day post-earnings move of about 4.5%. 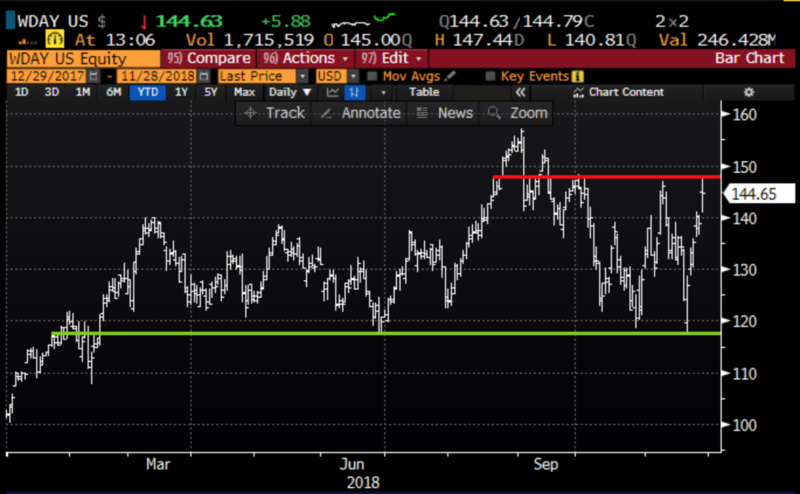 With the stock just below $145, the Nov 3th weekly (Friday expiration) 145 straddle (the call premium + the put premium) is offered at $9.50, so if you bought that and thus the implied earnings move you would need a rally above $154.50 or a decline below $135.50 to make money by Friday’s close. Back in early September, the stock declined 9.25% the day following their FQ2 report, from an all-time high, which culminated in a 24% peak to trough decline to last week’s five-month low. The Nov 20th intra-day low came at a level the stock has bounced from on numerous occasions in 2018, and for now seems to have found some resistance at the two-month highs. The stock’s bounce of late places the stock up 42% on the year, and only down 7.5% from the all-time highs made in Sept, showing tremendous relative strength to many of its high growth, high valuation peers. The stock caught a bid today on Salesforce.com’s (CRM) better than expected results and guidance issued last night. I would also add that I an in Phoenix at Credit Suisse’s tech conference and I have had the benefit of listening to a couple management presentations that bode well for WDAY. First, ServiceNow’s (NOW) CFO yesterday gave an upbeat presentation, suggesting that despite rumblings of weak global growth that the “demand environment for their products remains strong” and that their products in this day and age given the need for some many different industries to streamline internal processes with technology is kind of recession-proof. And this morning, CRM co-CEO Keith Block echoed that sentiment, going as far as saying that despite what you see and hear about the warnings of a global recession, they see a “ripping U.S. economy” and given their conversations with their customers they are skeptical that global growth is about to fall off a cliff. Analysts remain fairly mixed on the stock with 18 Buy ratings, 15 Holds and 4 Sells, while short interest is down to about 7.5% of the float. Last quarter investors shot first and asked questions later as the company’s unearned revenue growth of 25% was below some expectations, causing some to fear the start of a deceleration of bookings. I suspect the guidance given last quarter is achievable given the results of its peers. I guess the question though is whether or not the stock’s recent bounce incorporates any and all good news to be reported. Rationale: this trade risks 2.3% of the stock price with a break-even at the same, giving very near the money participation while offering a 2 to 1 payout if the stock is up $10 in line with the implied move. As always I will offer our normal disclaimer for short-dated long premium trades into events, you need to get a lot of things right to merely break-even, first and foremost direction, magnitude of the move and of course timing, This is a binary trade idea, get any of the above wrong and it is likely to be a near total loss. But I think this is a more attractive way to play for a post-earnings bounce than buying the stock here after its $25 one week rally. Rationale: this trade idea offers a 4 to 1 potential payout if the stock is down near its recent lows.